Actually, association with great sadhus gives such faith, because at the beginning stages as a neophyte devotee, so much of what we believe in is theoretical. But, when we see or hear about persons who really have this spontaneous attraction for Krishna and the activities of devotional service, it gives us something really to long for, to aspire for, and to give our very lives – to attract Krishna – so that we can also have that mercy. We cannot achieve bhakti. Bhakti is a gift. It is sudurlaba. It is the rarest of all gifts, because one who has bhakti conquers Krishna by his love. Therefore, Krishna only gives bhakti to one who is very, very sincere. When we read of the eternal associates of the Lord, and see the simplicity of the nature of their pure, unalloyed love, we understand that that treasure is what I want. Today we are associating with Srila Bhaktivinod Thakur through this beautiful song. Bhaktivinod Thakur wrote, “He reasons ill who says that Vaishnavas die, when Vaishnavas are living still in sound. Vaishnavas die to live and live to spread the holy name around.” So, through the sound vibration of their beautiful prayers, instructions, they live forever in the hearts of fortunate souls who receive their mercy. Bhaktivinod Thakur eternally exists in the spiritual world. He performed his pastimes in this world with the same purpose as Krishna himself – to attract the conditioned souls back to the loving service of the Lord. Thakur Bhaktivinod, Srila Bhaktisidanta Saraswati Thakur, Srila Prabhupada, Rupa and Sanatana Goswamis – all of these acharyas are living through their sound vibration in our hearts. So, let us hear Bhaktivinod Thakur’s incredible joy and enthusiasm for every single detail of the process of devotional service. And therefore, every aspect of Krishna Consciousness is simply ecstatic. What does it mean to take the dust of the feet of a Vaishnava? It is not just an extra ritual of just grabbing some particles. It’s a state of consciousness. The feet are the lowest, and usually considered the dirtiest part of the body. And the dust on the feet is the lowest part of the feet. So, when we aspire to take dust from the feet of the devotees, we want to put it on our head. That means the lowest part of that devotee, we want to put on top of our heads. It means completely submitting to, and humbling ourselves before that person. That’s what it means – to take dust. And how do we do that? Sri Chaitanya Mahaprabhu explains, by accepting the role of being the servant of the servant of the servant of the servant of Krishna, to actually want to be servant with one’s heart, to want to hear from the Vaishnavas, to want to please the Vaishnavas, to want to honour, respect and worship the Vaishnavas with humility. In our Vaishnava tradition, we are taught to call every other devotee Prabhu. If you call them Prabhu, I’m servant. Srila Bhaktisidanta Saraswati Thakur, this is how he would greet people. And amongst the Vaishnavas, he would say, “I am your servant.” He considered service to the Vaishnavas the supreme perfection. Bhaktivinod Thakur here is explaining it so precisely. Please hear what he’s saying. He’s saying, “Service to the Vaishnavas is itself the supreme perfection.” What do we do in the spiritual world? We are all servant of the servant of Krishna, eternally. When we serve Vaishnavas, we are actually on the platform of the supreme perfection. It’s the process, and it’s also the supreme perfection of all processes. Therefore, there is nothing so purifying.” Bhaktivinod Thakur continues, “Service to the Vaishnavas is itself the supreme perfection. And it is the root of the tender creeper of divine love.” If you want to nourish a tree or a creeper, you do not do so by watering the flowers, the leaves, the twigs or the branches. You must place water on the root. What is the root? But we know that an offense to Vaishnavas is mad elephant offense. When you offend Vaishnavas, you are actually damaging the very root of the creeper of devotion. There’s no more critical danger to any plant than damage to the root. With great, ecstatic love, Bhaktivinod Thakur is praising the dust of the lotus feet of the devotees and the service to the Vaishnavas. Bhaktivinod Thakur, he is rejoicing within his heart of hearts with anticipation to go on pilgrimage to these holy places in the association of loving devotees. And what do we do when we go on pilgrimage to these holy places? Bhaktivinod Thakur is not talking about shopping at bazar. He’s talking about hearing and chanting the glories of the Lord, day and night, in the association of devotees. We go alone to these places, our tendency is to go shopping, or to get sleepy. But, when we’re with so many devotees… here we have 1000 devotees that went to Sri Vrindavana dham during Kartik. 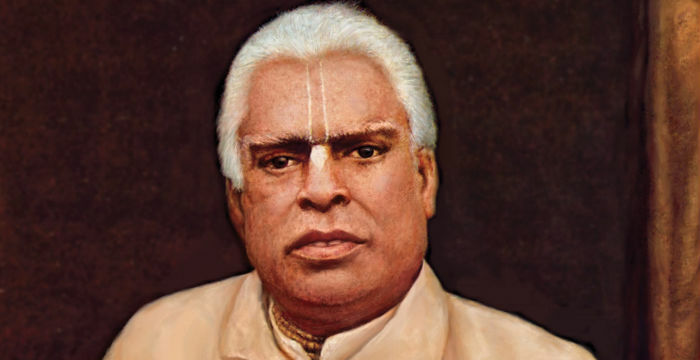 Thakur Bhaktivinod continues, “I feel the greatest joy by honoring the Lord’s Prasad. By honoring the Lord’s Prasad, I conquer over all worldly illusions.” Krishna’s Prasad is Krishna’s mercy. The glories of Prasad are expounded throughout the fourteen worlds. Our scriptures tell us that simply by taking the Prasad of the Lord you get more credit than performing ten thousand ritualistic sacrifices, fire-yajna and all of those things. The scriptures tell us: what to speak of the human being, even if an animal tastes Prasad, and likes the taste of it, because he’s appreciating Krishna’s mercy, that person is guaranteed a human life in his next birth and is guaranteed the opportunity to continue the devotional service he has begun. 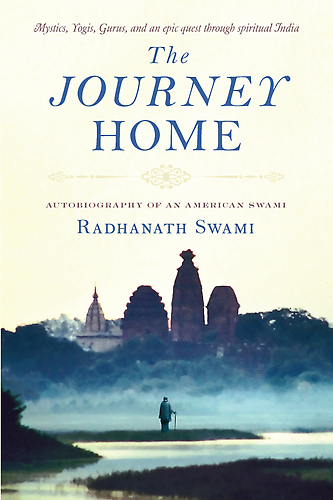 I said, “Do you know who I am?” He said, “You are an American boy.” He would not say Hare Krishna. So Prabhupada said secret weapon. Aah! So I first brought some… does everyone know what a cookie is? It’s an American food. When you offer it to Krishna, it becomes Prasad. It’s something children like to eat, so it looks pretty helpless. I mean, not helpless but harmless. So I said that my mother specially prepared this cookie for me to give you, because it’s her birthday. So he had tears in his eyes. He said, “Oh! Your mother is so thoughtful!” And right in front of me he ate the cookie! Actually it was made by one of the matajis of temple. So she is like mother. Chanikya Pandit says to see all women as your mother except your wife. So that’s everyone for me. As far as birthdays go, every time we remember Krishna, it’s our birthday. Yes. She was remembering Krishna. So I adjusted the truth in so many ways but he took it. And I was remembering Gadadhara Das when he got the kazi to say the name of Krishna. I was about to start dancing in his office in ecstasy saying, ‘Hari Bol! You have begun your spiritual life! Next life you are devotee whether you know it or not!’ Somehow I restrained my jubilation and enthusiasm as I saw him eating the cookie. And then the most glorious thing after he ate the cookie. 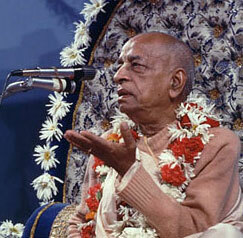 He said, “Tell your mother it’s very good.” Krishna consciousness began. This is the power of Prasad. The Bhagavatam explains: when the husband and wife respect each other and cooperate together in serving Krishna and the Vaishnavas, then the goddess of fortune lives in that home. Prahlad maharaja told his father, “My dear father, you are a grihamedi (that means, you are just an envious householder). Why you are envious? Because you are envious of Krishna. You are trying to enjoy the property that belongs to him!” To a materialistic person Prahlad maharaja said that their household life, their house is like a deep dark well. There is no water in that well. And you could call for help but no one hears to you. There is only suffering. Andakupam – deep dark well of family life. Of course, there are certain types of insects and frogs that actually like to live in that deep dark well even though they are suffering, because they just don’t know anything else. They are too much attached. That is grihamedi. Then what is grihasta life? When we accept that Krishna is the proprietor of my home, that Krishna is the Lord of our family and we are all united together for the purpose of serving Krishna and his devotees. Whatever food we buy is for the pleasure of Krishna. Whatever decorations or furniture are in the home it’s for the pleasure of Krishna and the Vaishnavas. “By honoring the sak, a dear favorite of Lord Chaitanya, I consider my life worthwhile.” What an astounding appreciation Bhaktivinod Thakur has for sak, which in English means spinach! He considers his life worthwhile to honour sak. Why? Because it is Gaura-priya. Because it is so dear to Lord Chaitanya Mahaprabhu. Whatever the Lord loves is what devotees love. Bhaktivinod Thakur ends this beautiful poem: Whatever Bhaktivinod obtains, that is conducive for the service of Sri Krishna, he accepts every day with the greatest joy.